Fabulous single/multi family year round vacation home close to Mt. Snow (3 min +/-), convenient to the Hermitage Club at Haystack, and minutes to surrounding West Dover/Wilmington amenities. Perfect location for both entertaining and/or privacy. Country kitchen w/ fireplace, tastefully furnished spacious rooms, hardwood floors, master bedroom suite with private bath, outdoor hot tub (Winter Season only), portable grill (Summer Season only), indoor sauna, garage, mud/ski room, lower entertainment level, and great floor plan. New England natives, our family continues to enjoy all of the seasonal benefits the Mount Snow Valley has to offer. Whether a 24 hour retreat or spending multiple days, the Southern Vermont region provides a personal and realistic "recharge" of ones batteries. As with any family, there are a multitude of recreational, culinary, and cultural needs. This particular part of the state is both convenient to our primary home in Southern CT and certainly satisfies everyone's desires! Conveniently located, yet situated off the beaten path, our home provides a generous floor plan for both large family outings or intimate social gatherings. The proximity to Mount Snow, The Hermitage Club, local hiking, regional farms, a variety of restaurants, a variety of regional services and amenities, allows for quick access. Multiple Bedrooms Multiple Bathrooms Harwood Floors with Area Rugs Country Kitchen with Fireplace for Entertaining Outdoor Hot Tub (Winter Season) and Indoor Dry Heat Sauna Note: Our home does not include linens and towels (yes, there are blankets, quilts, and pillows) as it only adds to your overall housekeeping expense. We do offer a "White Glove" linen service for an additional fee of $200. Master bedroom has its own private bath with shower. Two individual dining areas for entertaining. One table seats 8 and the other seats 6. Central sound system services both country kitchen and one of two main floor living areas. Ipod connection on amplifier. Portable outdoor gas grill is only available for summer season rentals. Outdoor dining table with four chairs and two chaise lounges are available during the late spring and summer months. Outdoor hot tub is available in Winter Season only. Todo muy bien , Excelente atención , el único detalle las almohadas viejas y siento que hacían falta más toallas . Pero la casa muy bien, la atención de primera y la ubicación perfecta. This home was a great stay. I had planned a reunion at this house with 14 people...everyone had ample room and a bed. The amenities in the house are better then expected. The house is close to the mountain which made it so easy for everyone. Great stay and defiantly will be back! Our group of 12 friends had an awesome stay for our annual ski trip here! It’s about a 5-10 minute drive to Mount Snow which is very convenient. Paul Is fantastic with communicating throughout the whole process leading up to and during our stay. The house was spacious, modern, well kept up, had plenty of room/beds for all of us, and came with a well stocked kitchen. Plenty of parking outside and in the garage for our vehicles was a plus. Would highly recommend this place! We had such a great time during our annual ski trip. The house was perfect - two living spaces for hanging out, lots of fun board games, amazing hot tub and sauna, and ample space for 12 adults. The house was stocked with everything we needed with lots of large pots and pans for chili making, spices for cooking, and a large fridge to store all our groceries. The mud room was great for putting our ski gear in and the house is really close to mount snow. We were there during a big snow storm, and the plow came immediately to clear us out. My only note is that this house is up a big hill so if you have a little car and it's icy it may be a bit difficult! We really hope to come back next year! PERFECT SETUP FOR A LARGE GROUP. SPENT THE END OF PRESIDENTS WEEK AT THIS HOME, IT WAS A GREAT TIME. THE HOUSE HAD EVERYTHING OUR GROUP NEEDED. HOPE TO BE BACK NEXT YEAR!! We stayed February vacation for 4 nights while skiing Mt. Snow and Stratton. It's close proximity (3miles) to Mt. Snow is great and it's a short ride (30 minutes) to Stratton. We were 3 families with 5 teenage children and the layout of the house was great for us. Basement had ample beds for the teenagers and 3 bedrooms on the 2nd floor for the adults worked extremely well. The foosball table and hot tub were a good diversion for the teenagers. Two sitting rooms with TV's in both was also nice so we didn't have to fight over what to watch. Paul and Deb were a pleasure to deal with and were very responsive when a question came up about the property. If and when we return to Mt Snow I would not hesitate to stay here again! 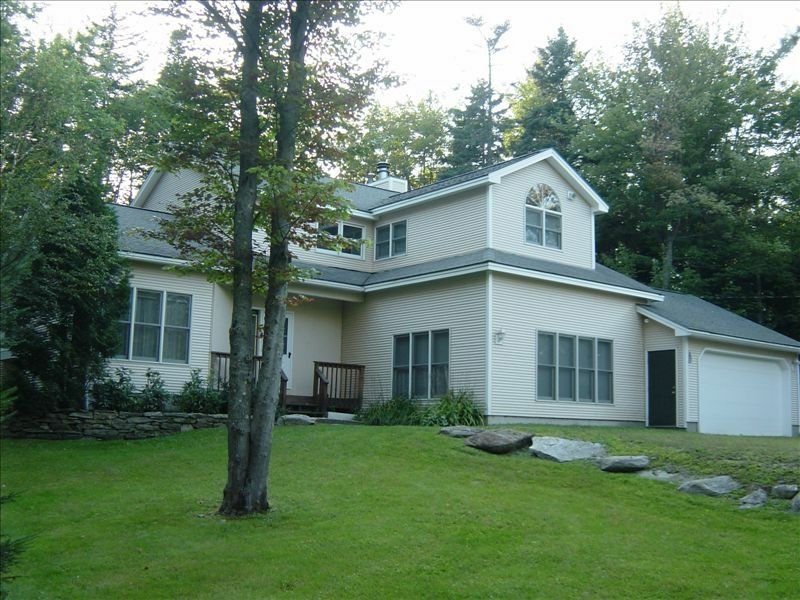 Conveniently located (1-2 miles) to both Mount Snow and all of West Dover's amenities. Approx. six miles north of Wilmington center and approx. 18 miles from Stratton Mountain.